There was no plan to take a vacation from blogging, but the holidays are a time to relax and have fun. Also, blogging + wine usually makes for some kind of consequence (usually a drunken rant). I've gotten a bit behind on this, but here is what I wore on the 23rd (or was it the 22nd?) to go to work. This was a great work outfit, and I'm finding that these tailored shorts are a nice alternative to dress pants with a little more versatility. Adding tights or a fun belt makes them fun but since they are so tailored its still office appropriate. 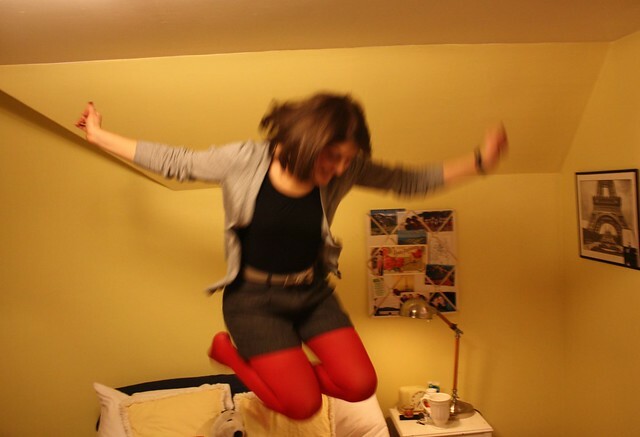 Plus, if you haven't tried shorts with tights, you should just because its so comfortable, like a skirt you can run around and climb fences in (or in my case jump up and down on the bed). As a warning, this post also contains ridiculousness and my fantastically cute Sanrio Chococat watch. How cute! I love shorts and tights, especially bright red ones. That watch is an eye-catcher. LOVE your shorts & tights (& belt)!! 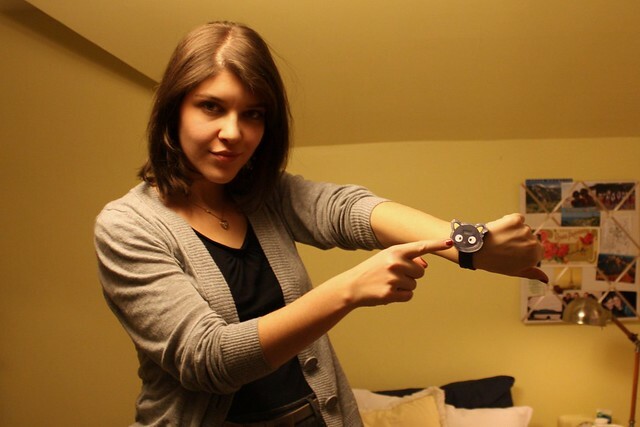 Also that watch is amazing. I hope you had a GREAT Christmas. :D I like your bedspread btw. I really love the bright tights with the shorts. Cute photos! ok I am totally in love with this outfit! What a great idea... I think I am going to need to try this! very comical and cute at the same time ;) merry xmas! I've been thinking of trying to score some tailored shorts... I love them with the bow belt and the red tights! Thanks for your comment! like your blog, you've got a pretty face! maybe we can follow each other? love, m.
Love your tights, I have so similar shorts and I wear them yesterday, I think you can match them with lots of stuff. 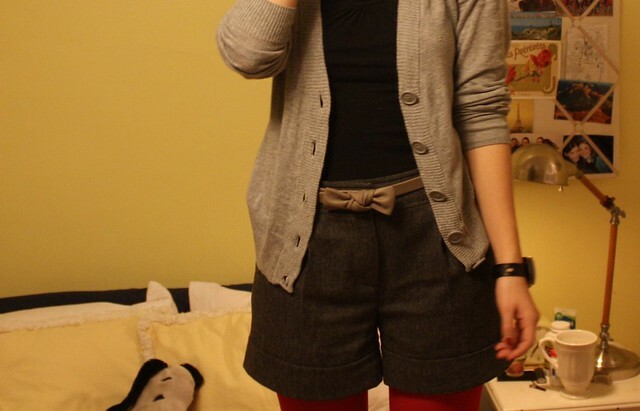 Definitely agree about the versatility of shorts and tights. It's nice not to worry about a breeze causing me to flash everyone around when I wear them. I love your outfit and the color tights! Love your belt and watch! these are such cute pictures! I love that your wearing a Mickey D's watch...awesomeness! From your previous post, I really like how you paired the cream sweater with the vibrant dress. And your necklace is really unique! It makes me miss Thailand so much! Anyways this is a lot of rambling, I just really like your blog and I am definitely following! Happy Holidays! Those tights are such a pretty red. & I love them with the shorts! I like you on shorts, they suit you so much! "If only everything were as simple as snow."